The home often became a platform of political consciousness, conveying a message of nationalistic pride and loyalty. Many households focused on the patriotism that the war evoked, displaying flags, cockades, engravings and sculptures with idealized themes, and many intellectual exchanges regarding the war and community involvement in war work were regularly articulated. Women were successfully constructing an impassioned attitude towards the operation and management of the war and chose to act on their concerns. The mass of activity and cultivation of war relief support began to diminish the concepts of their efforts as sentimental and emotionally rendered. "Through homemade products, military rallies, village parades, flag raisings, and fairs, women devised a visible national identity." (15) As the war progressed, women's involvement became increasingly more significant. Patriotic rallies and war-inspired personal and home decoration stood in contrast to the grim reality of war. While sentimental images such as those seen in Currier and Ives prints, and Rogers Groups statues became popular, rapid changes in printing technology enabled newspapers and weekly publications to illustrate the realities of life at the front by reproducing sketches by battlefield artists such as Winslow Homer and Edwin Forbes. Mathew Brady and his staff also traveled with the armies taking numerous photographs of soldiers, living condition of the troops, and the aftermath of the battles. The photos were publically displayed in many northern cities, and to a population confronted by these images, attempts at pacifying the home front proved increasingly futile as the war dragged on. Visit the Virtual Exhibits to see objects from The Barnum Museum's collection. The concept of war as an exclusively masculine province began to diminish as the efforts and skills of women became more apparent publicly and relied upon politically. Issues of gender distinct responsibility were challenged by war time demands and the ideology of the domestic sphere shifted to incorporate active national economic support. The government relied heavily on the provisions supplied by home work, and women were adamant that the resources they provided be accounted for and not disseminated for profit or waste. (16) Although men were not expected to work in government or war-related positions for free, work in the home was still considered an extension of a woman's normal domain and unpaid labor to support the Northern cause was initially expected and even considered appropriate. Women fortunate enough not to have to earn a living during the war directed their efforts in many volunteer organizations. The cohesion of local resources and fund-raising efforts by women created a unity of spirit and domestic emancipation. Already established local sewing circles and Christian associations were easily and quickly transformed into Soldiers Aid Societies, as members of these community organizations banded together to coordinate provisions that were to be shipped to the front. Rolling bandages, scraping lint, sewing, knitting and collecting donations were tasks eagerly pursued by many women vehemently concerned about the welfare of their loved ones. 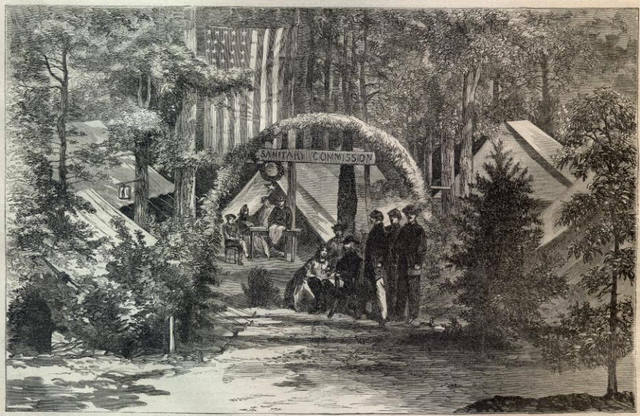 The assertion of public concern for northern soldiers established a standard of care and welfare for the Union troops. Six days after the fall of Fort Sumter, a group of New York women, under the direction of Louisa Lee Schuyler and Dr. Elizabeth Blackwell, organized the Women's Central Association for Relief. Armed with an appeal to the women all over the North, Schuyler devoted herself to actively spreading the word of the importance of home labor in support of the well-being of those off at war. Due to 'the wisdom and practical efficiency' of the Association the organization expanded rapidly and within a few months, the federal government in Washington approved the creation of a national society to care for the needy and injured soldiers under the name of the United States Sanitary Commission. Operating independently of the Medical Department of the United States Army, the Commission received no financial aid from the government, but relied entirely on donations from private individuals and commercial enterprises. Formally appointed in June of 1861, the United States Sanitary Commission developed as a benevolent war relief agency and was dedicated to the medical needs and humane quality of life for men in the field. Acting as a centralized organizer and maintaining a cohesion of operating efforts, the Commission was successful in informing women in local organizations of the immediate needs in the field and in streamlining their immense relief skills. In response to the many letters sent home, the Commission volunteers enthusiastically rose to fill the requests of husbands, sons, friends and even strangers. Letters from soldiers often reflected the desires of simple necessities reminiscent of home. Shirts, trousers, blankets, soap, handkerchiefs, and food were regularly requested to subsidize the irregular and inferior government issue. Prior to the Civil War, great charitable organizations had not existed. The Commission was the first formal operation created specifically to combat the difficulties of supply and alleviate the suffering of the sick and wounded in war time. Women came together to organize supplies to send to the field. Bandages, clothing, towels and blankets, as well as food and medical supplies, were assembled at a central location and shipped to the front, often arriving faster and more successfully than supplies from the Union Quartermaster. Local aid societies continued to spring up in communities all over the North and were converted to Commission auxiliaries, meeting in churches, private houses and public buildings. Rooms were converted into sewing workshops and storage spaces for collected supplies, and major storehouses of the Commission were located in Boston, New York, Philadelphia, Cleveland and Chicago, and even as close to the Confederacy as Cincinnati and Louisville. The Commission agents recorded donated items meticulously, providing receipts for the contributions. Packing instructions were supplied to the auxiliary groups to ensure the safe arrival of the shipping crates and their contents. Careful inventory of the items was recorded and it was not unusual for Commission inspectors to examine the crating before shipment and for every shipment to be accompanied by someone who was held responsible for the proper disbursement of the contents Although some crates did arrive at their destinations broken, spoiled or ransacked, more often than not, the assortment and crating of provisions surpassed the requirements of the Commission. Mary Livermore reflected on witnessing the packing of the boxes that, "every one [was] an argosy of love." (17) Notes were sometimes attached to the clothing, sending words of support to the unknown soldier who would receive them. Proceed to Sanitary Commission Fair. Return to The War Spirit At Home.